Today’s global challenges—poverty, civil unrest, political stalemates, economic divisions, climate change—play out daily against the backdrop of our living rooms. But if these problems seem too big and complex—easier to ignore than to even attempt to solve—know that there has never been a better time to engage. An explosion of technological innovation is transforming the way we live. And if we’re going to keep up with the rapid pace of change, we need to rethink the old ways of doing things. 1. Make a Big Bet. So many people and organizations are naturally cautious. They look at what seemed to work in the past and try to do more of it, leading to only incremental advances. Every truly history-making transformation has occurred when people have decided to go for revolutionary change. 2. Be bold, take risks. Have the guts to try new, unproven things and the rigor to continue experimenting. Risk taking is not a blind leap off a cliff but a lengthy process of trial and error. And it doesn’t end with the launch of a product or the start of a movement. You need to be willing to risk the next big idea, even if it means upsetting your own status quo. 3. Make failure matter. Great achievers view failure as a necessary part of advancing toward success. No one seeks it out, but if you’re trying new things, the outcome is by definition uncertain. When failure happens, great innovators make the setback matter, applying the lessons learned and sharing them with others. 4. Reach beyond your bubble. Our society is in thrall to the myth of the lone genius. But innovation happens at intersections. Often the most original solutions come from engaging with people with diverse experiences to forge new and unexpected partnerships. 5. Let urgency conquer fear. Don’t overthink and overanalyze. It’s natural to want to study a problem from all angles, but getting caught up in questions like “What if we’re wrong?” and “What if there is a better way?” can leave you paralyzed with fear. Allow the compelling need to act to outweigh all doubts and setbacks. We knew we were onto something when we shared these principles with friends and colleagues and started hearing from people in the private, public, nonprofit, and philanthropic sectors who wanted to incorporate the principles into their own work. Whenever I speak about being fearless, audiences are excited by how tangible the principles are. As someone said to me, “These are things I can do!” People often come up afterward and tell me their own stories of fearlessness, which light up my imagination and fill me with awe: a fourteen-year-old girl who created a nonprofit to cleanly dispose of prescription pills and drugs; a man who started a bakery to employ “unemployable” men and women just released from prison; a Cuban immigrant who created a formula for affordable assisted living; a Liberian activist who designed a program to help remote communities access medical clinics; a young farmer who invented a no-till process that will save one of earth’s most precious resources; a celebrity chef from Washington, DC, who figured out how to serve millions of meals to hurricane victims in dire straits. These people dreamed big, but most of them started with small, familiar steps. Reading their stories is like following a trail of bread crumbs: They made phone calls. They knocked on doors. They wrote their visions in big letters. They talked and talked and walked and walked. They found supportive communities. They didn’t take no for an answer. They did things anyone can do. 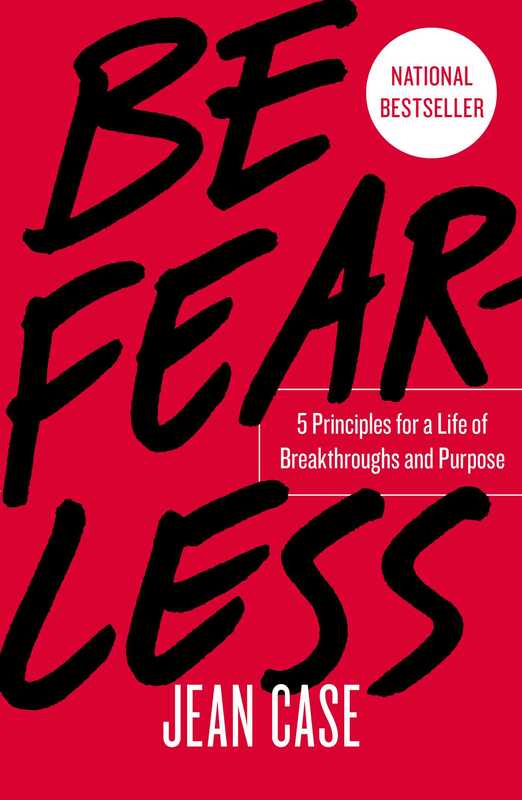 Whether you’re working at a start-up, finding yourself at a personal crossroads, working as part of an established organization, or looking for inspiration to make a life-altering change, the Be Fearless principles can provide guidance on how to take that next step. And the moment to do so is now. I am always inspired by people who challenge themselves and those around them by asking the question: “What would you do if you weren’t afraid?” Be Fearless tells the stories of innovators and activists, artists and entrepreneurs, scientists and explorers, and individuals from organizations and businesses who answered that question with actions that spoke louder than words. Some of these individuals are household names; others you might never have heard of. As you read about them, I hope you’ll imagine yourself standing in their company.